Roman Abramovich is on the managerial mooch again and according to The Sun, the Chelsea owner has his sights firmly set on the all-conquering Barcelona boss Pep Guardiola. The suave and sophisticated Guardiola, just 41 (I hate him), sees his current deal at the Nou Camp finish at the end of the current season, leaving the Spaniard open to other options. Abramovich apparently wants to offer Guardiola a four-year deal worth £10 million-a-year after tax, a big improvement on the Barca supremo’s current net salary of £8 million-per-annum. If the Blues do get their man, he will be the eighth manager to serve the club under Abramovich, a ridiculous figure. 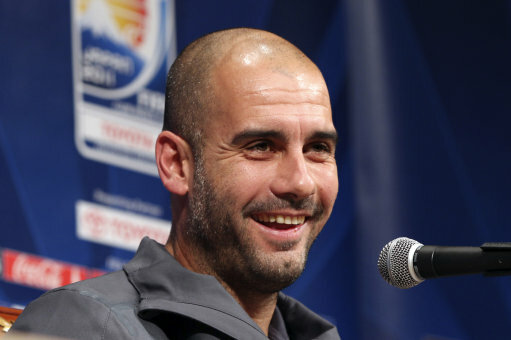 However, would Guardiola really want to come to Stamford Bridge? If not, and he does decide to leave Barcelona, which other clubs would he be tempted by – Manchester United with their history, Arsenal with their footballing ethos? Or would he go to Serie A? What do you think? Personally, I think he’ll stay put. He ain’t dumb. Also got a funny feeling we may be seeing Laurent Blanc holding that Chelsea scarf aloft sooner rather than later. Whoever wins la liga out of Guardiola or Mourinho will quit their job first I think, so they can claim they’re better than the other and run off. Pies, you source the worst types of sources. First goal.com now the sun. Is it a slow day or something?